Thinking about how big corporations and cloud computing fit together, I came across the word "Internal Cloud" when reading more on the EMC Atmos. While big corporations may not want to move to external cloud for the sake of control, there is a middle ground where they can still take advantage of an internal cloud. A cloud service comes with a virtualization layer for the distributed computing resources beneath. First, every object has a URL. Second, every object has meta data. Third, every access to the objects is using HTTP/SSL. This layer simplifies many management tasks. For example, Gladinet can insert another virtualization layer, aggregating different cloud services together for the presentation. 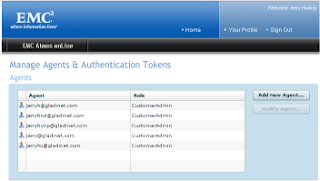 For those of you haven't seen EMC Atmos Online, here is a picture of the admin console. You can create multiple users within the same account, as compared to Amazon S3's one S3 per account. Out of the box, Atmos supports a group of users and is fit for an internal cloud deployment. Imaging later on, other technologies appear to enrich the Atmos layer, such as mapping an Active Directory user to Atmos user; providing single sign-on between NT token and Atmos token; creating SharePoint like collaboration accounts. When it is all done and set, all that left to do is switching the DNS name for the access point. Saves deployment cost, saves management cost. Server side computing. All with an Internal Cloud. If you have EMC Atmos, you can go on to download the Gladinet Cloud Desktop, map Atmos Online as a virtual network drive and start drag and drop data across. What happened to Adrive support? wow! you've "discovered" RAID storage farms and fabric!